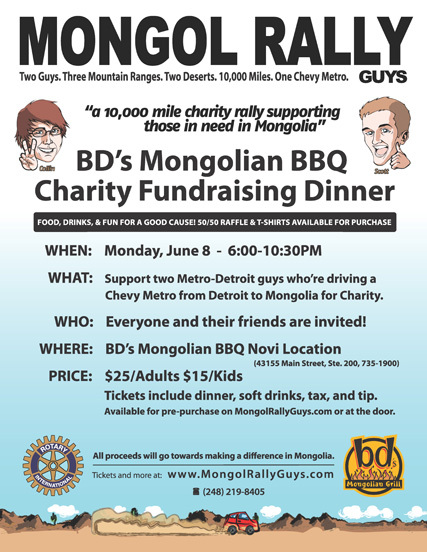 Everyone is invited to our official send-off party and charity fund-raising dinner on the evening on June 8th at BD’s Mongolian BBQ in Novi, Michigan! Tickets are $25 for adults and $15 for kids and include dinner, soft drinks, tax and tip. A good portion of that goes to us, so come on out and show your support! We will also be selling T-shirts and having a 50/50 raffle. This will be the last event that Scott is present at, as he is leaving for the UK on June 14th. Tickets may be purchased at the door or online via credit or debit card through PayPal (above). If buying online please specify whether you will attend the 6:00 seating or the 7:30 seating—you can stay as long as you wish, but we need to know an approximate count for each time. Stay tuned, as we will be having additional events posted here as the dates are finalized. We have organized two major events before we head over to the UK. 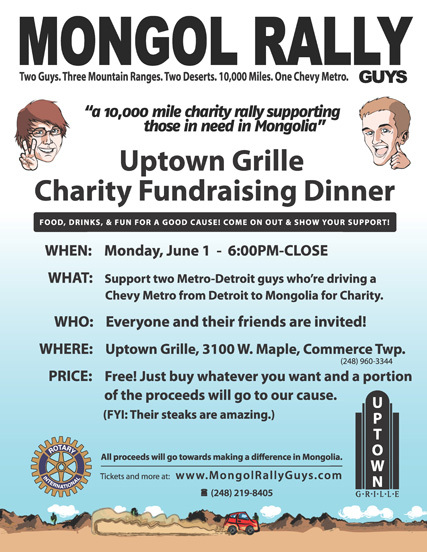 The second is on Monday, June 8th at BD’s Mongolian BBQ in Novi—details are above. The first one is a week beforehand, on June the 1st at Uptown Grille in Commerce Township, Michigan. No tickets or RSVP needed—just come out anytime after 6PM and order as much food and drinks as you want, a portion of the revenue will be going towards our cause. So please be sure to come out, bring your friends, bring your family. If you have never been before, Uptown Grille is a very big bar & restaurant with an amazing selection of beer and some of the best steaks in town. Looking forward to seeing everyone there! We have finally gotten the car running to the point where it can make it to the mechanic’s place (well…we had to tow it actually), so we took the opportunity to take some pictures and introduce everyone to our vehicle! Thanks to Charles, our ‘team mechanic’ for the time has has put (and will put) into helping us fix her up. 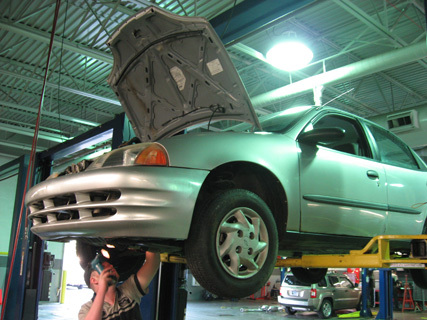 And thanks to Matt for his hard work getting our brakes in an operable condition…it’s scary not having any brakes. Take a look over at the Gallery page for more shots of our trustworthy (?) steed.